The first iOS app that stops unwanted calls and texts, with the world’s biggest directory of telemarketers – 3,000,000+ from 100+ countries! Sign up to find out about app updates or new platforms first! Callblock is something of a sequel to our ad blocker, Adblock Fast, which has 3,000,000 users and is rated 4.5 and 4 stars in the App Store and Google Play since launching alongside iOS 9 then the Samsung Galaxy S6. We’ve built on our experience filtering online advertisers to compile, classify, and apply the world’s biggest directory of telemarketers, featuring millions of entries from almost every country in the world. 1. Reduce unwanted calls and texts by more than 85 percent. 2. Filter more than 3,000,000 telemarketers by type. 3. Add and report missing or misclassified telemarketers. 4. Just tap to caller-ID only rather than block telemarketers. Facts and figures on telemarketing, The Houston Chronicle, accessed September 6, 2016. Cutting off robocalls, The Federal Communications Commission, accessed September 6, 2016. Do-not-call list “useless”, critics say, The Canadian Press, accessed September 6, 2016.
Who may or may not call?, The Federal Trade Commission, accessed September 6, 2016. 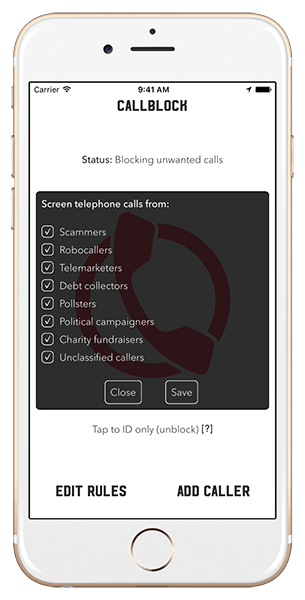 Callblock’s new iOS app will block calls, TechCrunch, accessed September 7, 2016. Calls were sampled and Callblock’s identification of telemarketers, evaluated in May 2017. Show or hide the raw benchmark data. toggle the Callblock switch on. 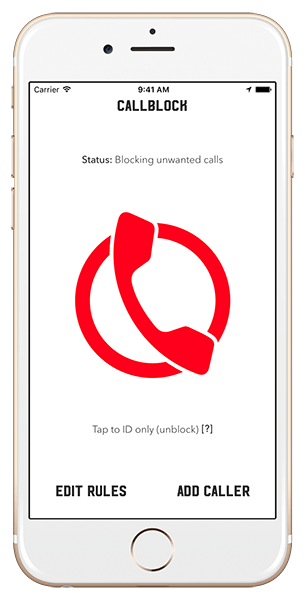 To unblock calls and texts, go to the Callblock app. To add, remove, or reclassify a missing or misclassified caller, tap the Add caller button. Enabling Callblock or making changes in the app may take up to a minute to take effect. If you have any questions or comments, you can follow and message us on Facebook or on Twitter or can send us mail at help@callblockapp.com. Callblock is designed, developed, and maintained by Rocketship, an award-winning app studio and the maker of the popular ad blocker Adblock Fast. 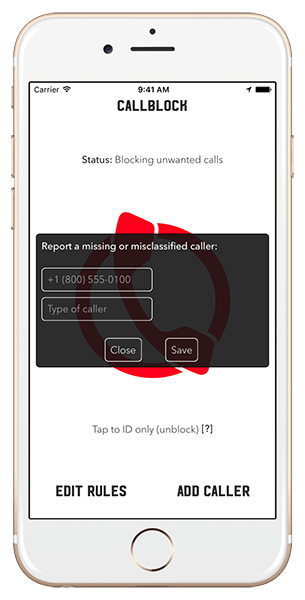 What’s an Unclassified caller in Callblock? An Unclassified caller is one Callblock has identified as a telemarketer but not yet which type. Which countries does Callblock work in? Where does Callblock’s directory come from? Callblock’s directory of telemarketers is compiled from public and private records, the results of our ongoing research and testing, and user reports. An average of more than 10,000 new entries are added to the directory and existing entries, reclassified daily. The app autoupdates to include these changes. When will Callblock be available on [insert platform here]? Callblock is available for iOS 10 and up on 64-bit phones, iPhone 5s and up. Subscribe to be notified when versions for other platforms become available. Why is a subscription required if Callblock was purchased? You don’t need a subscription if you bought the first version of Callblock, but later versions can’t determine that you did if you’ve since deleted the app. Forward your App Store receipt to help@callblockapp.com, though, and we can credit you with a subscription. How can a subscription to Callblock be canceled? Apple (not developers, like us) handles subscriptions in iOS. See their instructions for managing your subscriptions. How much does Callblock cost? You can try Callblock free for a month. Afterwards, the app is $1.99 monthly or $19.99 yearly. Is allowing Contacts access required to use Callblock? Unlike similar apps, Callblock doesn’t need to access your Contacts and doesn’t collect or sell your Contacts data. Are Unknown callers blocked by Callblock? 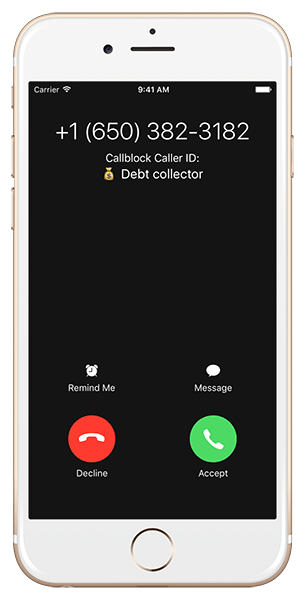 Callblock can’t block any call or text without a caller ID. This is an iOS limitation, but most telemarketers attempt to seem legitimate by not blocking their caller IDs. Does Callblock list blocked calls somewhere? Can a missing caller be added to Callblock? To add or remove a missing or misclassified caller to or from Callblock’s (local) directory (and to report the caller for review to help improve the distributed directory), tap the Add caller button, enter the caller’s telephone number, and choose which type the caller is or the Not a telemarketer option if the caller isn’t a telemarketer.